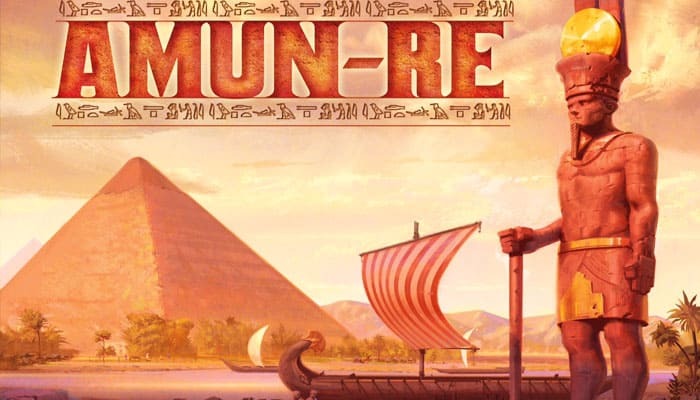 Amun-Re is an auctioning and development game that evolves as ages go by. Claim your place as the greatest pharaoh of all time to win! 1 Lay the game board face-up in the center of the table. 2 Form a supply of Stones, Pyramids, and Double Pyramids in the Quarry. 3 Form a supply of Farmer tokens. 4 Form the Gold Reserve by sorting the Gold cards by value, placing the resulting stacks face-up beside the game board. 5 Place the Offering tiles face-up beside the game board. 6 Deal 1 Architect Favor card to each player, then shuffle the remaining Favor cards (with statue backs) together. Place this Favor deck beside the game board. 7 Build the Province deck (with pyramid backs) based on the number of players. The Province deck should include 3 Province cards per player. With 5 players, all Province cards will be used. Return any unused Province cards to the game box--they will not be this game. 8 Each player selects a color, then collects the 3 Scribe pawns of that color. Return the components of any unused colors to the game box. 9 Place a Victory Point marker of each - player's color beside the game board's score track, and return any unused markers to the game box. You can and should make change with the stacks of Gold cards at any time. Whenever an amount of Gold is referenced, it is referring to total value in Gold cards, which can be formed by any combination of appropriate Gold cards. When you pay Gold for bids and purchases, return the Gold cards to the Reserve. 11 Deal 1 Theft card to each player, and return any unused Theft cards to the game box. 12 Randomly determine a Start Player, and give that player the Start Player token. During the game, the Start Player may change based on the Offering to Amun- Re. Actions during the Auction, Market, and Harvest Phases always begin with the current Start Player, and proceed clockwise around the table until each player has taken his or her turn. As the leader of a royal Egyptian family, you must compete against the others to ensure history remembers you as the greatest pharaoh of all time! 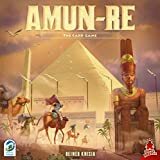 Amun-Re is played over the course of 2 ages, called the Old Kingdom and the New Kingdom. Each age consists of 3 identical rounds of play (sub-divided into 4 phases). Scoring is done at the end of each age. Finish the game with the most victory points to win. For each phase and during Scoring, there are specific Favor cards that can be played. At any time during the game, players may discard any number of their Favor cards for 1 Gold each. Note: You cannot play 2 identical Favor cards in the same phase or during Scoring. At the beginning of the Auction Phase, draw 1 card from the Province deck for each player, and then place them face-up on the game board over their matching Provinces. These Provinces are available for auction during this round. For each Province card you place on the game board, also place any Stones, Favor cards (face- down), and Gold cards indicated in the brown "Immediate Bonuses" box in the Province. Immediate Bonuses are shown in brown boxes. They are awarded as soon as you gain control of a Province. Permanent Bonuses are displayed in the sand along the side of a Province's border. They provide an ongoing benefit for as long as you control the Province. Favor: Indicates the maximum number of Favor cards you may purchase during the Market Phase (1 per symbol). Only your Province with the most Favor symbols counts--they are not added together. Gold Mine: Provides a regular Gold income during each Harvest Phase. Caravan: Provides a Gold income during each Harvest Phase, but only if the Offering tile features a Camel in its illustration. Temple: During each Harvest Phase, scores Victory Points featured on the most recent Offering tile. Fields: Each Field space may house up to 1 Farmer token. Farmer tokens are acquired during the Market Phase, and provide an income of Gold based on the most recent Offering tile. You may not place Farmer tokens in Provinces that do not feature Field spaces. Next, beginning with the Start Player and proceeding clockwise in order, each player must place a bid on a Province's unoccupied bidding space, or pass if he or she already has a winning bid on a Province. Use one of your Scribe pawns to represent your bid. When bidding on a Province that another player has already bid on, your bid must be greater than the current bid. However, you may make a bid that is greater than the next bidding space available on the Province if you wish. If you are outbid on a Province, your next bid cannot be placed on the same Province. If you are outbid again in a future turn, you may return to bid on a different Province where you were previously outbid. Bribery: During your turn in the Auction Phase, if you have been outbid on a Province card, you may play the Bribery Favor card to make a higher bid on the same Province card. Protection: When you place a bid during the Auction Phase, you may play the Protection Favor card to block the next-highest bidding space on that Province card. This means that another player would have to place his or her Scribe pawn at least 2 bidding spaces higher to outbid you. If you later move your Scribe pawn to another Province card, your Protection Favor card applies there, too. You cannot bid more Gold on a Province than you currently possess. The auction ends when exactly 1 player's Scribe pawn is present on each Province. Players must then pay Gold to the Reserve in the amount of their bids and leave behind their Scribe pawns on the game board to indicate control over the appropriate Provinces. Finally, players collect any Stones, Favor cards, and Gold indicated on their newly-acquired Provinces' brown "Immediate Bonuses" boxes. The Province cards are removed from the board and placed onto a discard pile. Starting with the Start Player, you may make purchases from the supply in the buying order indicated on the game board- -Favor cards, then Farmers, then Stones. When purchasing from the supply, pay Gold to the Reserve according to the scale printed below the buying order, depending on how many of that item you purchase. Each purchase is made separately, so buying 1 of each item would only cost a total of 3 Gold. Once you have already purchased an item, or passed on an opportunity to do so in the order, you will not have another chance to buy that item during your turn. 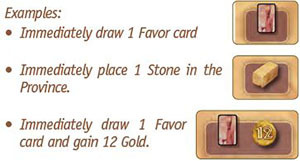 0-4 Favor cards, which are drawn from the Favor deck. The maximum number of cards you may purchase is determined by the highest number of Favor symbols present in a single Province you control. If you do not control a Province with 1 or more Favor symbols, you cannot purchase Favor cards. Farmer tokens, which must each be placed immediately in an open Field space in a Province you control. You cannot purchase Farmer tokens that you are unable to place. Farmer tokens cannot be placed in Provinces that have no Field spaces. Stones, which must be placed immediately in one or more Provinces you control. Free Farmer: Play a Free Farmer Favor card during your turn in the Market Phase. When you do, acquire 1 Farmer token from the supply at no cost, and place it in any Province you control. Unlike other Farmer tokens, a Free Farmer is not placed in a Field space. It may be placed in any Province you control, even if that Province does not feature any Field spaces. Acquiring a Free Farmer is separate from your normal purchase of Farmer tokens--if you decide to buy 3 other Farmers, for example, you will still only pay 6 Gold. Unlike Favor cards, it is possible to purchase more Farmer tokens or Stones than is shown by the cost scale on the board, as long as you have space for them. If you want to purchase more than 7, calculate the cost by following the formula below: The cost to purchase 8 = the cost to purchase 7 (28) + 8 = 36 Gold; the cost to purchase 9 = the cost to purchase 8 (36) + 9 = 45 Gold; etc. You are not obligated to make any purchases. However, if you do, you must make all of your purchases before passing the turn to the next player. Construction: As soon as a third Stone is placed in a single Province, immediately replace those Stones with a single Pyramid. If a single Pyramid was already present in that Province, then replace it with a Double Pyramid. Multiple Pyramids may be built in the same turn, as long as each Pyramid's Stone requirements are met. Architect: Play an Architect Favor card during your turn in the Market Phase. When you do, you may build 1 Pyramid in a Province you control using only 2 Stones. You may not play an Architect Favor card during any other Phase, even if you have just placed a second Stone in a Province you control, and if you have placed a third Stone, all 3 Stones are immediately replaced with a Pyramid even if you possess an Architect Favor card. 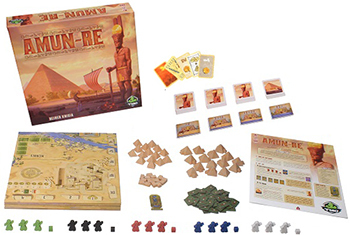 During the Offering Phase, players choose and simultaneously reveal Gold cards or a Theft card, representing a joint offering to Amun-Re to convince him to flood the Nile. The sum of the offered Gold dictates the scoring value of Temples, as well as the incomes offered by Farmers and Caravans during the Harvest Phase. Secretly select 1 or more of your cards and, covering them with your hand, hold them out to show that you have finalized your Offering. Once all players have finalized their Offerings, reveal them simultaneously. If you offer 1 or more Gold cards, your Offering's value is equal to the sum of all Gold cards you contributed. If you offer your Theft card, you instead steal 3 Gold from the Reserve. In either case, you may include a blue Favor card to adjust the Offering. Other Favor cards may not be included in the Offering. Add the individual Offerings together, remembering to reduce that total by 3 for each Theft card that was played. Beginning with the Start Player and proceeding clockwise in order, players that included a blue Offering Adjustment Favor card in their Offering must now declare whether they would like to increase or decrease the Offering. These adjustments only affect the value of the collective Offering--the value of your individual Offering is unaffected. Once the collective Offering has been calculated, place the corresponding Offering tile in the Nile Delta space. (For example, if the total Offering is 10, use the tile marked 3>12. If the Offering is 25, use the tile marked 23>). If you played your Theft card, return it to your hand. Remember to steal your 3 Gold from the supply! Collect rewards - The player that contributed the most to the Offering may now collect 3 Rewards. These Rewards may be any combination of Favor cards, Stones, and/or Farmer tokens. The player that contributed the second highest Offering collects 2 Rewards, and all other players collect 1 Reward in turn order. However, players that played a Theft card cannot collect a Reward. In a tie, the player earliest in turn order wins. The number of Favor cards you can acquire from a Reward is not limited by the Permanent Bonus Favor card symbols in your Provinces (unlike in the Market Phase). Farmer tokens must be placed in open Field spaces and Stones must be placed immediately in your Provinces. If there are ever 3 Stones in the same Province, replace them with the appropriate Pyramid. Reminder: Architect and Free Farmer Favor cards cannot be played during the Phase. Determine the new Start Player - The player who offered the most Gold collects the Start Player token, and will be the new Start Player for the next round. If there is a tie, the player earliest in the current turn order becomes the new Start Player. The Nile has flooded. Beginning with the Start Player and proceeding clockwise in order, players will now receive income from the Provinces that they control. For Gold Mines - Gain Gold equal to the indicated number. 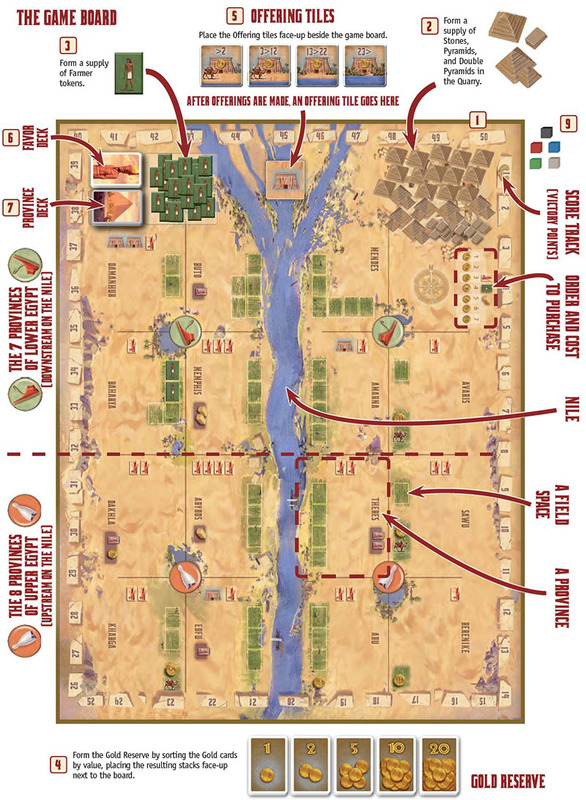 For Caravans - Gain Gold equal to the number indicated above the camel, but only if a camel is depicted on the current Offering tile. For each Farmer Token in the Provinces you control - Gain Gold equal to the amount shown on the current Offering tile. Treasury: Play this Favor card during the Harvest Phase, before calculating your income. When you do, select a single Province you control. Do not collect income from that Province this turn - not from Farmers, Caravans, or Gold Mines. Instead, collect 8 Gold from the Reserve. Big Harvest: Play this Favor card during the Harvest Phase, before calculating your income. When you do, select a single Province you control. Each Farmer token in that Province provides 1 additional Gold this turn. After all players are finished with the Harvest Phase, the round ends, and a new round begins. If this was the third round of an age, the Province deck will be empty. When this occurs, the age ends, and Intermediate Scoring occurs. After Intermediate Scoring, if that was the end of the second age (New Kingdom), then proceed to Final Scoring and the game's end! Intermediate Scoring occurs at the end of each age. To perform Intermediate Scoring, award Victory Points (VP) for the following: . +1, +2, +3, or +4 VP for each Temple depicted among Provinces you control. The scoring value of each Temple is determined by the Gold shown on the current Offering tile. +1 VP for each Pyramid in a Province you control. Double Pyramids count as 2 Pyramids. +3 VP for each Pyramid in your single Province with the fewest Pyramids. If you control a Province with no Pyramids, then you do not score any VP for this item. +5 VP for the Province that contains the most Pyramids on each side of the Nile (+5 VP for the west, and +5 for the east). In case of a tie, the player whose Province contains more Stones scores the VP. In case of a further tie, all tied players score the VP. +3 VP for each yellow Favor card whose conditions are satisfied. Reminder: You cannot play 2 identical Favor cards during the same phase or during Scoring. If this is the end of the first age (Old Kingdom), remove all Scribe pawns and Farmer tokens from the game board, returning the Farmer tokens to the supply. Collect all of the Province cards from the game board and shuffle them into the Province deck. Pyramids and Stones are not removed from their Provinces, and remain on the game board. They are no longer considered controlled by any player until that Province is claimed in a future Auction Phase. If this is the end of the second age (New Kingdom), immediately proceed to Final Scoring. +2 VP to the player with the third highest value. In case of a tie, all tied players score the appropriate VP, but subsequent players are moved down. For example, if 2 players are tied for highest value, they both score +6 VP, the player with the second highest value then only scores +2 VP. After all VP has been awarded, the player with the most VP wins! In the event of a tie, the tied player with the most Pyramids among his or her Provinces wins. If there is still a tie, the player with the most Stones among his or her Provinces wins. If still tied, the victory is shared. Expert rules allow tactical control of when Provinces are available. At the start of the game, after shuffling the Province deck, deal 3 Province cards to each player. Return any remaining Province cards to the game box without looking at them. Keep these cards secret from other players. At the beginning of each Auction Phase, each player selects 1 Province card, and the chosen cards are revealed simultaneously. These Province cards are available during this turn's auction. At the beginning of the New Kingdom, shuffle all Province cards that were played during the Old Kingdom, and deal them out evenly to each player.